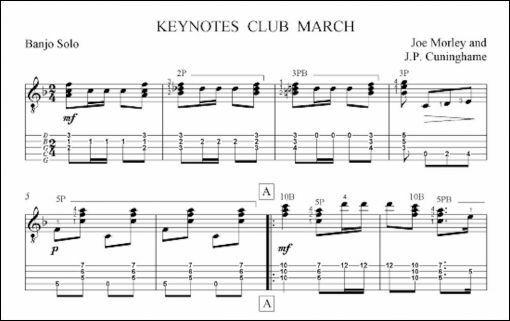 KEYNOTES CLUB MARCH BY JOE MORLEY & J. P. CUNINGHAME. 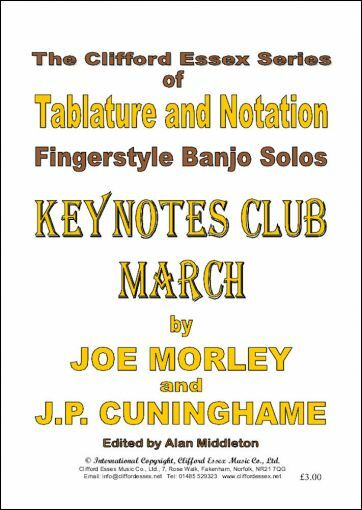 Location: /Sheet music/Fingerstyle Banjo/KEYNOTES CLUB MARCH BY JOE MORLEY & J. P. CUNINGHAME. The inaugural meeting of the Keynotes Club was in September 1925, but the title was changed to ‘The London Banjo Club’ some time later. The first President was J.P. Cuninghame, an outstanding amateur banjoist, and among subsequent presidents was Joe Morley, generally accepted as the foremost professional player of the time, so it is not surprising that this solo should bear both names as joint composers. The piece consists of a short Introduction, three sections, and an eight bar Coda, all in the key of F major. It is a fairly easy solo, with a rousing fourth string melody in the second movement, and was probably enjoyed by all the Club members playing as a combined band.